Java uses delegation event model approach to handle events. What is delegation event model? Concept is quite simple:a source generate an event and sends it to one or ore listeners.In this scheme, the listener waits until it receive an event. Once an event is received, the listener process the event and and then returns. Here are short definitions of event, source, listeners. An event is an object that describes a state change in a source. It can be generated as a consequence of a person interacting with the elements in a graphical user interface. A source is an object that generates an event. This occurs when the internal state of that object changes ijn some way. Sources may generate more than one type of event. A listener is an object that is notified when an event occurs. It has 2 major requirements. 1. Listener must have been registered with one or more source. 2. It must implement methods to receive and process these notifications. 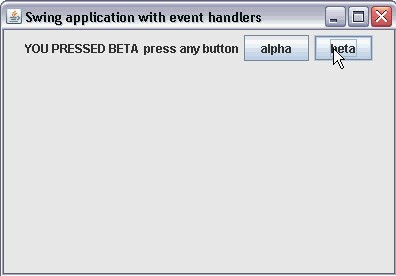 To implement Event in a program you need to import awt.event package. Now lets see a sample program. If you are new to swing then, see how to start a swing. First import packages for event handling. Initialize two buttons using, JButton(). And then add action listener to the button. Using addActionListener(), this methods takes ActionListener. And actionperfomed(), it takes ActionEvent ae as a parameter. Make a note that semi colon is given at the end. Jlab.setText(), is used to display message when you press ja button. And everything is simple and self explanatory. Java programming in Eclipse IDE. Start learn java from beginning.